As was the case with previous Chinese launches, Wednesday’s liftoff was not broadcast live nor were any images of this event released after start of the mission. The country usually confirms its own launches about one hour after lifting off when a spacecraft is successfully inserted into orbit. However, this time, the state-run media are still silent about the mission even though a day has passed since the liftoff. Western analysts suppose this silence, along with no confirmation from the US Strategic Command regarding new objects in orbit, could mean that the mission failed or the launch was scrubbed or that there was no lift off at all. On Thursday, Sept. 1, however, pictures of rocket debris were published in Chinese social media sites, indicating the launch had indeed taken place. The wreckage was found by local residents in the Shanyang province, some 370 miles southwest of the launch site. It appears the pieces of debris are part of the Long March 4C’s first stage. 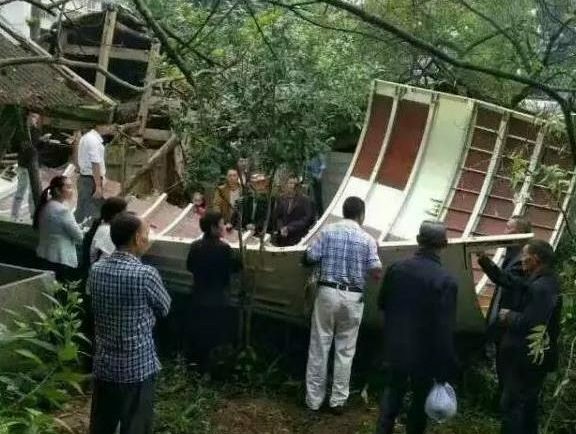 Moreover, latest images being published by Chinese citizens, show pieces of a payload fairing were also recovered. They were found in the village of Shengjiaba, located approximately 700 miles southwest from the launch site. While the first stage and payload fairing fell to Earth along the expected flight path, within indicated drop zones, the fate of other parts of the launch vehicle is still unclear. 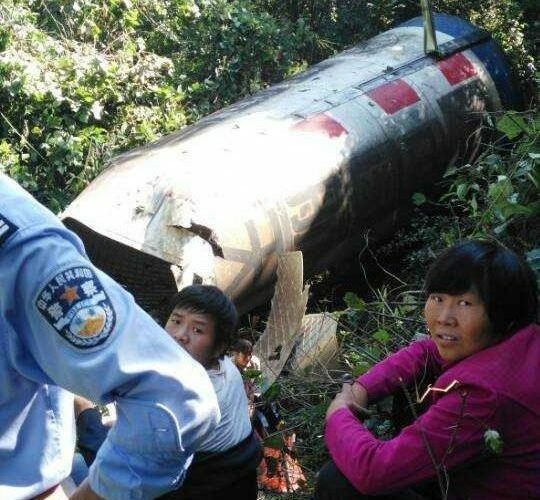 The debris found by villagers confirms only that the flight was flawless until at least the payload fairing separated. Some anomaly could occur later when the mission was powered by the second or third stage. Possible failure could also have happened during the scheduled spacecraft separation. Taking all these clues into account, it seems that Chinese officials decided not to report the failure and remain tight-lipped about the mission and its outcome. Gaofen-10 (meaning “high resolution” in Chinese) was supposed to be injected into a Sun-synchronous orbit (SSO) Wednesday. It is a civilian Earth-observing satellite for the China High-Resolution Earth Observation System (CHEOS), initiated in 2010. CHEOS is designed to provide real-time, all-day global Earth observation in any weather for disaster prevention and relief, climate change monitoring, geographical mapping, as well as environmental and resource surveying. The CHEOS program comprises the elements of a space-borne system, near-space system, aerial system, ground system, and application system as a whole to realize Earth observation at high temporal, spatial, and spectral resolution. The first Gaofen satellite was launched in April 2013. The previous launch in the series took place Aug. 9, when the Gaofen-3 spacecraft was lifted off atop a Long March 4C launcher, also from Taiyuan. By 2020, it is hoped the entire seven-satellite CHEOS system will be in orbit. The primary data users of the program are the Ministry of Land and Resources, the Ministry of Environmental Protection, and the Ministry of Agriculture. The Long March 4C booster employed for Wednesday’s launch has a liftoff mass of an estimated 250 metric tons and is 150 feet (54.7 meters) in length with a diameter of 11 feet (3.4 meters). It is capable of delivering payloads of up to 4.2 metric tons to the low-Earth orbit, 2.8 metric tons to SSO, or 1.5 metric tons into a geostationary transfer orbit. Wednesday’s launch marked the 235th flight of the Long March rocket and the 13th orbital mission conducted by China this year. If the Gaofen-10 launch failure is confirmed, it would be the first unsuccessful mission for the country this year. In late 2016, China plans to return to human space flight. Shenzhou-11, a planned crewed mission, is slated to lift off from Jiuquan and dock with China’s upcoming second space lab, Tiangong-2, which should be in orbit by the time the crew’s Shenzhou spacecraft is sent aloft. The orbital laboratory is planned to launched Sept. 13 atop a Long March 2F/G rocket from the Jiuquan Satellite Launch Center, while Shenzhou 11 will be lifted off by a Long March 2F booster sometime in October. Such Secretive Measures like Old Dynastic Rulers. Wow, that local residents siting near a Long March debris? Isn’t it contains toxic Dinitrogen Tetroxide – UDMH? Not the kind of damage (debris, actually…) I’d expect in a launch disaster. No obvious signs of a massive explosion, fire damage, etc. It’s as if it had just “hard-landed.” Maybe their payloads are someway “secured” against launch failures (using parachutes, etc. )?